More fun at Eurocamp at Ca' Savio, Venice. Day Three began the same as Day Two. Cockerels crowing from 5am. The kids didn’t awake til 9am. I’m informed it’s 9am. I can’t tell. My phone provider (The People’s Operator) doesn’t allow international use of your phone unless you give them a £50 deposit and four month’s bank statements. I wasn’t happy to do that so my phone doesn’t connect here. That means I’m not sure what time it is because I don’t know if my phone has updated. I’m quite a simple chap. Breakfast on the decking was leisurely. Fresh coffee, bought from the site shop and prepared with the supplied cafetiere, was lovely. The sky was a little overcast and there were distant rumbles of thunder. Definitely not as warm as the previous day. Ca’ Savio is great if your kids love to swim or paddle. We have swimming pool about 150m from our cabin. There’s another set of pools nearer the entrance, and we went to those ones today because they were next to a set of play parks that were suitable for our youngest two. There were also pools for the older kids. Jack (13) had a bit of an accident. He slipped and bashed his face off a metal pole at the top of a water slide. He was convinced he’d broken his nose but it was just a bit bloodied and bruised. The kids finally got to play on the pirate ship with water slide. The ship had two small slides and a bucket at the top that intermittently filled up and splashed over any swimmers underneath it. Great fun! After the pool, we checked out the play area shaped as a giant fort. It was really cool for the younger ones. The adjacent toilets, however, were missing toilet rolls, which was a bit of an inconvenience. Then, back to the beach again! Much milder and windier, but still fun. We got the air conditioning fixed, which was a huge blessing. Still no word on getting the blinds fixed. The one in our bedroom is now permanently closed. Not ideal. I wasn’t too fussed about the England v Iceland game, but the Italy v Spain game was a big deal, being in Venice. We managed to get a decent seat and ordered some pizzas. 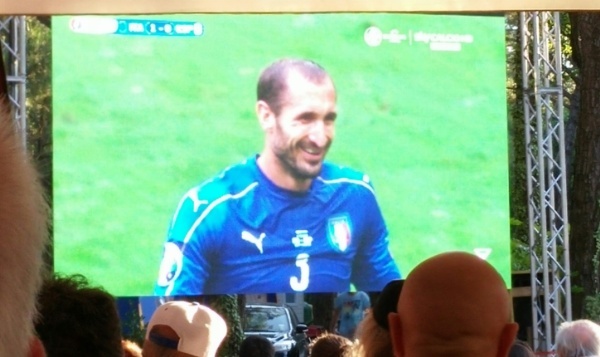 The atmosphere was electric, with Italy knocking out the mighty Spain 2-0! The England game was a lot more flat, with England playing the worst I’ve ever seen then play. After that, the day caught up with us and we retired, zonked. A good day! 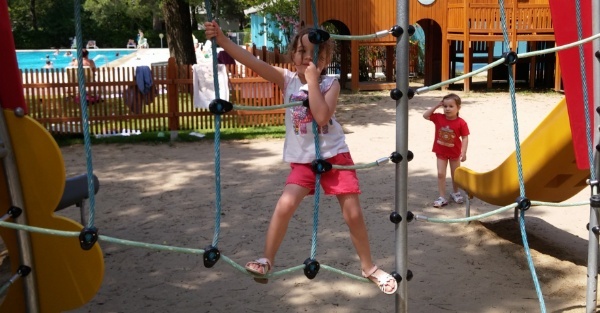 Ca’Savio Holiday Park is great for kids of all ages. Good facilities and lots to keep them busy all day long. The mosquitoes don’t even seem to bite them! Astounding that anyone with a brain in their head (as you seem to have, Grant) would ever select The People’s Operator in the first place. Don’t you know who runs it? A serial entrepreneurial failure. Look at TPOP’s stock price over the past 12 months. I doubt the company is even going to be in business by the end of this year.